The basic single-lead rhythm strip is still used in many offices as a quick verification of ongoing abnormal rhythms. New or used, inexpensive equipment can be found through many equipment vendors. This allows for rapid evaluation of symptoms reported during an office visit. Slightly more expensive, 12-lead ECG machines provide not only useful information on the ongoing rhythm but may demonstrate ischemic changes or prior or ongoing injury pattern. Multiple lead analyses help discern difficult-to-see P waves during arrhythmia evaluation as well. The single-lead and 12-lead ECGs are helpful only for ongoing arrhythmia analysis. Obviously, short-lived events or events that occur unpredictably are rarely identified by these simple techniques. Ambulatory 24-hour recording of a single or multiple leads is performed through Holter monitoring. Small patches or electrodes are placed on the skin and are attached to a digital or analog recording device, usually worn on the belt. Off-line data analysis is performed and relayed to the interpreting provider. Monitoring over 24 to 48 hours allows for increased sensitivity in ambulatory screening. Longer periods of monitoring can be performed using small, 30-day recorders. By recording and repeatedly overwriting the last several minutes of a rhythm, individuals with very infrequent events can lock in a symptomatic event and then transmit the information over the phone. This method may also be helpful in monitoring response to pharmacologic therapy such as rate control in atrial fibrillation. However, prolonged electrode contact can result in skin irritation and poor patient acceptance. Newer, implantable loop monitors became available in the early 1990s. Devices smaller than a disposable lighter are implanted under the skin overlying the chest wall. Lasting 18 to 30 months, these loop recorders have automatic and activated memory. Evaluation of the recorded events is performed in the clinician's office, remote from the clinical event. Implantation is usually performed by a cardiologist or an electrophysiologist when other recording efforts have failed. Figure 27-33 Mechanism of typical atrioventricular (AV) nodal reentry. The AV node (AVN) is drawn schematically with fast and slow pathways. Differential conduction and refractoriness is noted between the two pathways. The P pathway (fast pathway) has fast conduction and long refractoriness; the a pathway has slower conduction and shorter refractoriness. Left, The depolarization wave front from the atrium penetrates both pathways. The P pathway conducts the wave front faster than the slow pathway, and the P-R interval is normal. Center, Block occurs in the fast pathway. The slow pathway conducts the wave and depolarizes the ventricle. The P pathway (fast pathway) has time to recover, and conduction proceeds retrograde up the fast pathway and depolarizes the atrial tissue once again, resulting in an AV node echo beat. Right, Continuation of the reentry can occur. As the fast pathway is activated in the retrograde fashion during an echo beat, the slow pathway, with a shorter refractory period, is able to recover. The excitable tissue can then be activated, and conduction again proceeds back down the slow pathway (a pathway), and the cycle continues. tricular tachycardias may also occur. 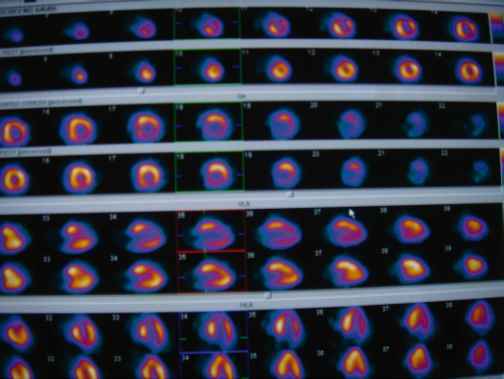 Ischemia as a trigger for arrhythmias may be detected. Exercise testing should be considered in patients with reproducible, activity-associated arrhythmias and in those suspected of long QT syndrome or who manifest preexcitation. Inpatient evaluation of arrhythmias is seldom needed. However, patients with clinical syncope or transient loss of postural control thought to be arrhythmic, patients in whom ischemia-induced arrhythmias is a concern, and those with a clinical history concerning for a life threatening ventricular arrhythmia should be considered for inpatient evaluation. In this setting, an organized testing regimen may be employed during continuous ECG monitoring. • What is the origin of the impulse? In essence, determine the P-QRS relationship. Determine if the P wave is the initial event or the secondary event and if it is associated with neighboring depolarizations. If P waves exist, examine the morphology and determine if it is appropriate for the lead reviewed. If the rhythm is irregular, do the irregular beats look the same? These steps will help decide if the rhythm comes from the atrium, AV junction, or the ventricle. Further differentiation into irregular atrial events such as atrial fibrillation (AF) or multifocal atrial tachycardia can be made. Wide QRS beats may arise from premature ventricular contractions (PVCs), bundle branch block, or preexcitation. • What is the basic heart rate? Is the rate appropriate for the origin of the impulse? This will distinguish tachycardias from bradycardias or normal rates for the rhythm (e.g., sinus arrhythmia). • Is the rhythm regular? Is this appropriate? A fixed, regular ventricular response in the setting of AF suggests third-degree AV block and may be caused by digitalis toxicity if the rate is greater than expected for a junc-tional escape. • Are intervals appropriate and constant? Changes occur in setting of altered origin of impulse, basic heart rate, and with varying degrees of block (e.g., type I second-degree SA or AV block). • Are QT, ST segments, or T waves helpful? Are Q waves present? This may give clues to ongoing metabolic, isch-emic or drug effects that cause common arrhythmias. With these few questions in mind, most rhythm strips can be interpreted correctly. Basic interpretation begins with a rhythm strip of good quality, typically representing lead I, II, or V1. Multiple leads aid in the diagnosis but are not always necessary. Evaluation of heart rate, intervals, and axis is necessary. Regularity of the rhythm, consistency of the P waves, QRS complexes, and T waves and abnormalities of the ST segment should be characterized.